On being subjected to long stretches of tuning at some early music concerts I’m reminded of the old joke about going to a fight and having a hockey game break out. Even if the tuning doesn’t actually take longer than the musical works on the program, its repeated eruption throws things badly out of balance: before the music has even begun, the listener’s excited anticipation deflates. Between the pieces the flow of the concert is continuously diverted because of all those finicky viols with their profusion of strings, and even worse the lute in the unwieldy state to which it had evolved by the eighteenth century. One contemporary wag quipped that having such an instrument was more expensive than keeping a horse, and that if a lutenist lived to sixty years of age, forty of those had been spent tuning the beast. In a modern symphony concert the tuning proceeds quickly and has a strictly policed ritual form that hearkens back to the militaristic origins of the orchestra as an institution. The second-in-command – the concertmaster – orders an A from the oboe and then directs the various platoons to fall in line with the pitch. The present-day orchestra has modernized musical weaponry that can be quickly calibrated: the mustering of the troops takes about a minute. This demonstration of uniform sonic discipline then quickly recedes into respectful silence for the entry of the generalissimo – the conductor – who leads his army into battle against the massed armies of one great power or another – Brahms, Beethoven, or some new contender. Such discipline is often absent among the disorganized irregulars of many an early music battalion. Their dutiful fussings are necessary perhaps, but often dispiriting. In the eighteenth century tuning was typically done to a prelude improvised by the organist or harpsichordist. He was charged with slowly traversing harmonies that made for useful references for the adjustments of the stringed instruments. The American musical traveler and collector Lowell Mason heard precisely this approach in the nineteenth century in Bach’s old church of St. Thomas in Leipzig. Mason reported that the result was the most out-of-tune band he’d ever heard. Nowadays there are apps for iPhones and kindred gizmos that make off-stage tuning possible for strings and winds. But some recalcitrants cleave to their twentieth-century ways rather than go back to the eighteenth or join the twenty-first. Imagine never having to listen to protracted tuning at a concert – neither before nor during. Such a concert would have two robust halves of music separated by an intermission that felt like it had been earned rather than just being more dead time to added to that already killed by the tuning. And while we’re bent on focusing our concert on content, uplift, and edification, let’s dispense with the clutter of applause and move things along directly between the pieces with an enlivening script presented by a fabulous speaker/actor who brings the story of the concert to life as no set of stuffy program notes could ever do. And since we’re cleansing the stage of distraction, let’s sweep aside the scores and the music stands. Disappear the conductor, too. Impossible, you say, to ask every one of the dozens members of an ensemble to memorize their own parts in a program that approaches two hours in duration. And to expect all these disparate minds to remain on track without traffic-cop direction given by a conductor will lead to too many collisions to count. How can all these folks remain on the same page when there is no page in the first place? But banish these objections for a moment further and picture these unencumbered players interacting with one another musically and physically, sometimes moving about the stage in a kind of dance and assuming visually striking formations. The seated soldiers of music rise up to become ever-changing tableaux vivants. What this revolutionary approach opens up is the possibility of a concert as theatre in which the grace and vibrancy of bodies at music become integral to the performance. Such a vision of performed music, be it is classed as early or modern, is no mere pipedream. One of the world’s great baroque orchestras, the Toronto-based Tafelmusik Baroque Orchestra has brought this ideal to eloquent and unforgettable reality with its “Galileo Project” conceived for the International Year of Astronomy in 2009, marking four hundred years since Galileo Galilei made his first astronomical observations and Johannes Kepler published the Astronomia nova. Dressed all in black but with touches of color brightened by the colored hair of two of the female violinists, the players moved silently onto the stage to welcoming applause and started right in – no tuning! – with a Vivaldi concerto whose virtuosic allegro and seductive largo astonished and seduced, two things the night sky is also very good at doing. While this sensuous music of Venice introduced the Harmony of the Spheres in the context of the Galileo Project, it evokes for me the water and tenuous earth of its birthplace, Still, there is also something weightless and celestial in this eighteenth-century top-of the-charts stuff when done by Tafelmusik and its long-time director, Jeanne Lamon, recently retired but for the time-being still at her post. From Vivaldi’s Venice we moved to France by way of Ovid’s Metamorphoses and comets and skyscapes seen through the Galilean lens to witness Phaeton’s disastrous crash of his father Apollo’s sun chariot. This suite of pieces came from Jean-Baptiste Lully’s 1683 Phaëton, the magnificent tragédie en musique about the ill-fated teenage joyrider. Tafelmusik literally moved from the overweening confidence of the pompous overture to the inexorably elegant and elegiac Chaconne in which twelve of the musicians themselves formed a circle and, like the signs of the zodiac, rotated through their choreographed yearly cycles. These motions allowed for the players to engage in seemingly spontaneous – but in fact carefully staged – dialogues of artistry and emotion in configurations at or near center stage that momentarily escaped the gravitational hold of the group. From France we vaulted back a century to the musical world of Galileo, himself an amateur lutenist who came from a family of musicians. 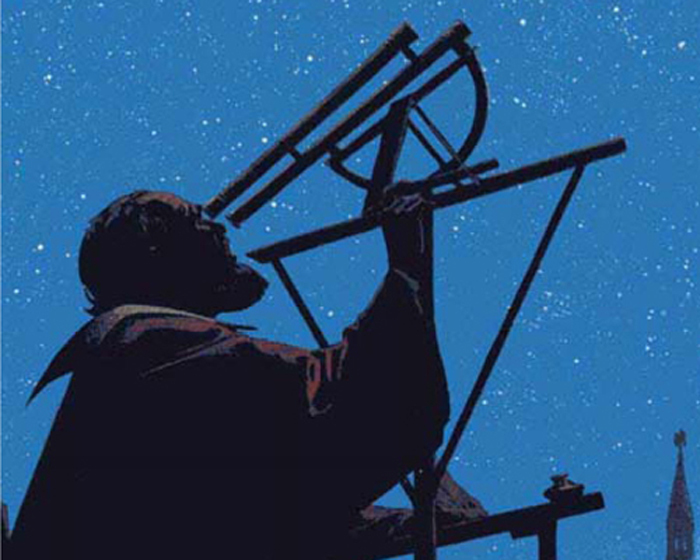 Galileo first demonstrated his telescope in 1609 in Venice, the same city that would later foster – and occasionally thwart – Vivaldi’s prolific genius. The transition was achieved effortlessly through the recitation of Galileo’s own writings by the narrator, actor Shaun Smyth. An Albertan born in Scotland, Smyth brought with him from the old country a mastery of dialects of the British Islands that he deployed occasionally – and only when called for – with humor, flare, and taste. Smyth and the musicians traced the chronologically retrograde path from Vivaldi to Lully to Monteverdi Smyth by way of McKay’s insightful and well-researched script. Now with Galileo we heard the streaking comet of Monteverdi’s concerted madrigal Zefiro torna set by Tafelmusik for its two cellists, Christian Mahler and Allen Wheat, singing through their instruments like cosmic angels. Unleashed from the planets Plato imagined them sitting, they ran wild through earthly meadows and woodlands. A deft modulation lead to another treatment of same bassline by a fellow composer of Venetian stamp, Tarquinio Merula. We then retreated the shadows of a solo lute Toccata by Galileo’s younger brother, Michelangelo, the piece played with captivating melancholy and finesse by one of the orchestra’s most potent forces, lutenist/guitarist Lucas Harris. The plaintive voice of his instrument, designed to be heard in renaissance chambers, drew the hundreds-strong Bailey Hall audience into its inner feelings with a pull as strong and ineffable as gravity. It was a piece Galileo would have heard and indeed likely played himself, especially during the years of his long house arrest. These offerings were framed by pieces from the most famous work of Galileo’s time and place, Monteverdi’s Orfeo, which premiered two years before the astronomer first pointed his telescope at the sky. After a fact-checking peek at the night sky from the plaza in front of the concert hall, I returned from intermission to my seat just as the orchestra marched back on stage for a Purcellian prelude to a re-imagining of the festival of planets organized in Dresden for the Saxon-French royal wedding of 1719: with Rameau, Handel, Telemann and Zelenka we toured Jupiter, Venus, and Mercury. After Smyth’s hilarious rendition of an eighteenth-century English drinking song that lauds and ridicules the paradigm-shifting discoveries of Copernicus, Kepler, and Newton, we heard J. S. Bach’s flights of fancy around Venus in the sinfonia to his cantata, How Brightly Shines the Morning Star (BWV 1). The chorale melody around which the other contrapuntal parts orbit resounded from one of the orchestra’s wonderful oboists placed in the hall’s distant balcony – yet another instance of the group’s creative use of the venue as a tool for mapping sound and space. The evening closed with a rocketing rendition of another of Bach’s beloved cantata sinfonias, the opener to BWV 29. This piece had once been repurposed by Bach from a solo violin work to an organ concerto. It was again transformed by Tafelmusik into a violin concerto during which yet another of the group’s many star fiddle-players had a chance to shine, concluding a concert/performance that among its many marvels was an astounding feat of group memorization demonstrating the limitless reach of music in and as motion that, like the Keplerian cosmos, was never out of tune. Once the tap-tapping of the piano tuner finally ceased, the halls of Max Planck Florida Institute for Neuroscience fell silent. But before Juilliard artist Yoonie Han arrived for the first of four “Science Meets Music” concert/lectures at the Jupiter [FL] institute, a scientist sat down at the keys and delivered a performance to be remembered. At the piano was the institute’s soft-spoken scientific director, Dr. Ryohei Yasuda, whose breakthrough research on the biochemistry of short-term memory recently made the pages of a prestigious journal, PNAS, the Proceedings of the National Academy of Sciences. Yasuda admired the piano’s inner machinery, its sleek black wood. He recalled his childhood in Japan, and a mother who demanded he spend an hour a day practicing. He resented it then, but things changed as he grew into his teens and the music of Chopin, Beethoven and Bach opened to him. And so at the first opportunity that chilly January day, he placed his fingers on the Steinway’s keys, and straight from his memory, played Chopin’s Fantaisie-Impromptu. One by one, scientists left their benches and computers and stepped in to listen. When Yasuda’s fingers finally rested, the hall shook with applause, and he looked up, amazed that a crowd had gathered. A neuroscientist and an accomplished musician. How could one person be both? It’s a question that has occupied many researchers: Does the study of music increase intelligence or improve creativity? Harvard neurology professor Dr. Gottfried Schlaug has investigated it for many years. Functional MRI and other technologies have illuminated just how specialized areas of the brain are. Above the ear, for example, is where the auditory cortex lies. Within it, specialized bundles of neurons respond to precise frequencies of sound, each tuned to its own range. However, to perform beautiful music, Schlaug notes, the brain must perform a multitude of integrated, complex tasks, all linked to this auditory cortex, going far beyond the simple recognition of pitch. Singing, for example, requires verbalizing words, knowing language, and moving the diaphragm to force air through the throat, while tightening and relaxing muscles to achieve correct pitch. It requires a sense of rhythm and cadence, a sensitivity to volume, and even an expression of emotion. It demands detailed memory of how a piece should sound and the ability to visually glean meaning from dots and lines on a page. Playing a guitar, piano or violin requires the brain to do all of this while simultaneously directing precise movements of fingers, hands, arms and shoulders. How does the brain manage all of this? New advances in imaging technology are allowing scientists to go beyond functional MRI and begin to actually see thoughts in real time, to see the specialized networks of nerve bundles work together to store memories and activate motion. Harvard’s Schlaug has found that those who started learning to play an instrument as a child develop brains that are different. They contain more gray matter – especially in an area called the corpus callosum, which is where the parts of the brain that respond to sensory stimuli and initiate movement meet. Hearing music lights up many more sections of their brains, on both sides, especially the inferior frontal gyrus, a region involved in speech and quick decision-making. They also may have important differences in white matter, the “cables” of the brain, which transmit instructions among regions, allowing coordination. In certain areas, musicians’ white matter architecture shows greater alignment and stronger connections. In a review for The Neuroscientist, Schlaug suggested this may underlie studies that have found higher IQs among musicians trained as children and greater mathematical ability. Music-making shows promise as a treatment of brain and developmental disorders, he noted. 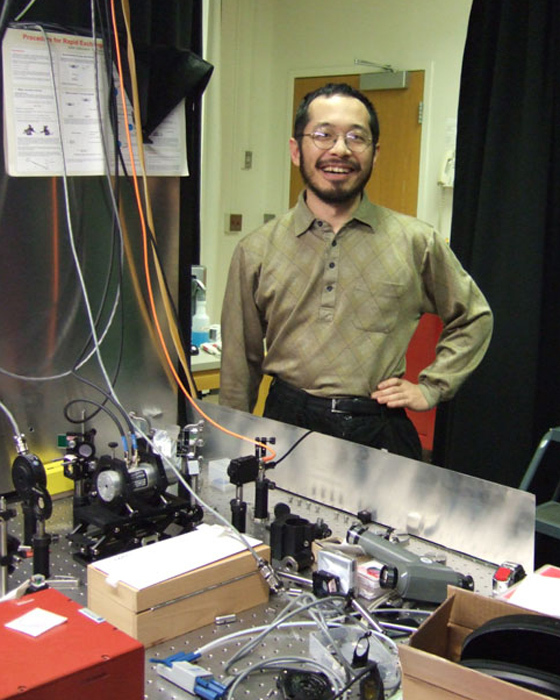 Yasuda believes that his mother’s demands that he practice every day prepared his brain not just for music, but for his scientific career. “I think probably the practice process is something important for development. It requires patience, involvement, commitment for many hours. These are all important to do research,” he said. The world’s longest space exploration began today with the launch of a Voyager spacecraft from Kennedy Space Center at Cape Canaveral, Florida. In 1990 it could still be sending back information from the outer reaches of the solar system, four thousand million miles away. Its main purpose is to provide close-up pictures and scientific data about two of the outer planets, Jupiter and Saturn, both huge and somewhat insubstantial bodies consisting largely of the gases hydrogen and helium. 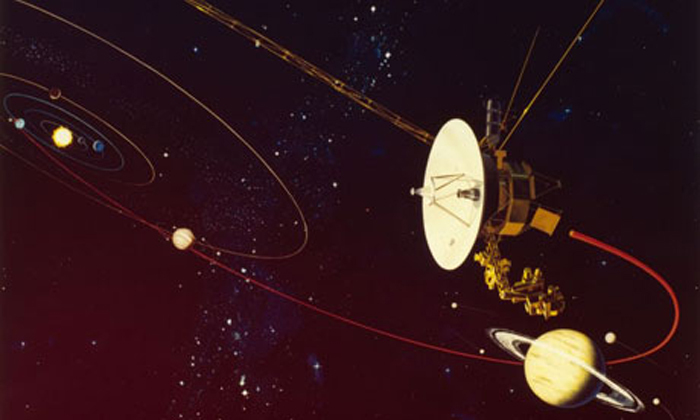 The Voyager spacecraft – another is to follow within the next fortnight – will take a close look at Saturn’s rings and at the moons of both planets. The most interesting of these seems likely to be Titan, a Saturnine satellite almost half as big as the earth. Titan appears to have an atmosphere consisting of a mixture of methane and hydrogen and might even have oceans full of liquid methane. The two spacecraft will also pass close to Jupiter’s satellites Callisto, Ganymede, Io, Europa and Amalthea (the first four were discovered by Galileo and take their names from Jupiter’s lovers) before using Jupiter’s huge gravitational field to swing them round on target for Saturn. Assuming the spacecraft are still in good shape after looking at Saturn, its rings and its satellites, one of them will continue to Uranus, recently discovered to have Saturn-like rings. Uranus will be reached in 1986, and then the spacecraft might be able to fly on to Neptune, the outermost of the planets. Only once in every one hundred eighty years do the planets line up conveniently enough to make such a grand tour possible. After Neptune, the spacecraft will glide off into the abyss of interstellar space, carrying with them some earthly artefacts in case they ever fall into the hands of civilizations way out in space. The cargo includes a recorded message from President Carter, some music (Bach and Chuck Berry), a complete listing of the membership of the US Congress and information in sixty languages. The chances that this message in a bottle will ever land on a friendly shore are infinitesimally small, and one or two scientists have grumpily accused the National Aeronautics and Space Agency of gimmickry. 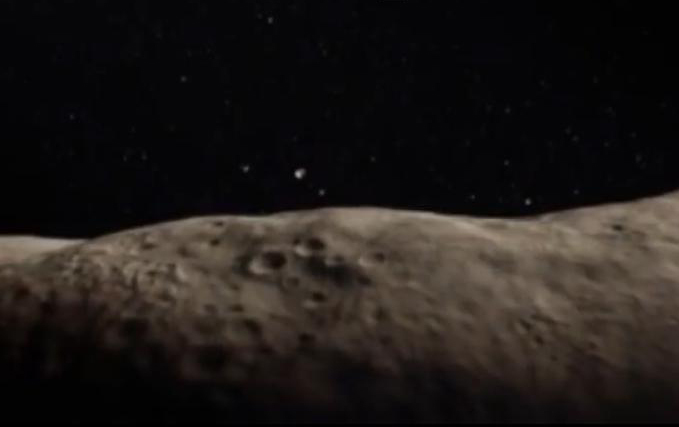 But it does no harm, takes up little of the spacecraft’s cargo capacity, may have helped to extract the money from Congress and makes the stern scientific purposes of the mission seem more human. “1814 Bach” was discovered between the orbits of Mars and Jupiter by astronomer Karl Wilhelm Reinmuth in 1931. Named after Johann Sebastian Bach, the diameter of the main-belt asteroid is approximately 10km. An animation depicting a voyage to Jupiter through the asteroid belt, featuring Concerto in F minor for harpsichord (BWV 1056), has been created by Russian electrical engineer busiko2.